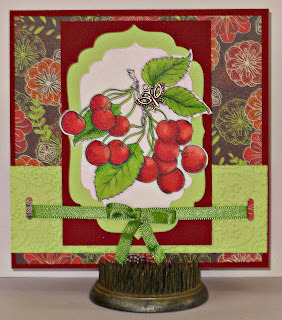 I'm on a roll today....this is my second card for the Flourishes release challenges. This one is for the Christmas Sweets Challenge. We are to use red, green and white in a card. I also used the out of the box technique that Julia was challenging us with a week or so ago. My apologies for the picture. My canon camera had the audacity to run out of battery power and I have to use my old point and shoot cannon, which doesn't seem to be giving me the best clear picture I'd like. I also had a problem with my markers as one of them made a blob of ink on the image just as I was finished coloring. Since it took me 2 hours to get this card going, I decided to add a butterfly charm to try to cover it up. Arrghh--it's all very frustrating today for some reason. Anyway, I beat the entry deadline, so I'm off to do some more creating. Great card Janet, those cherries are wonderful! Thanks for playing along with us at DDCC! So pretty! Love the colors! 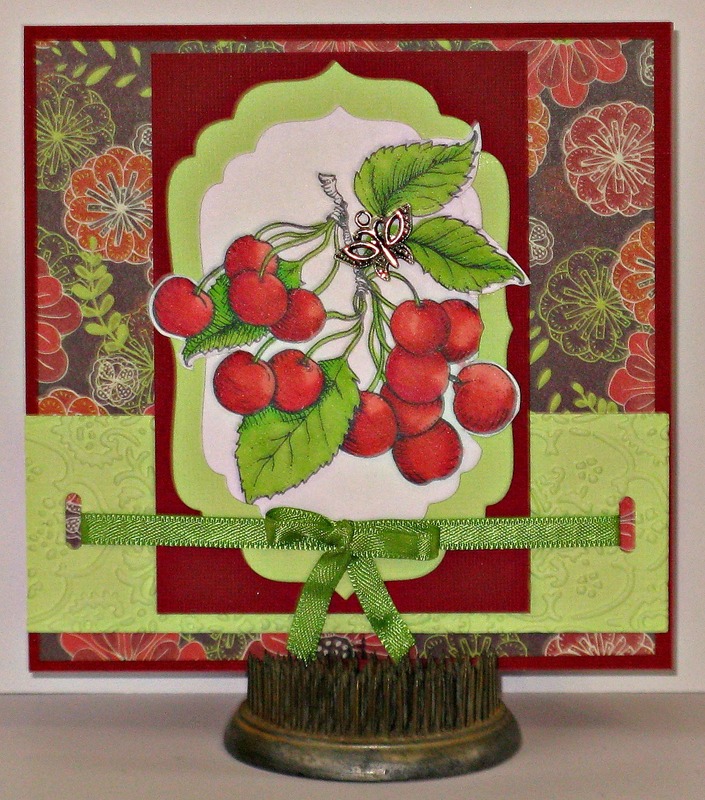 Thank You so much for joining our punch and die-cut challenge at Dutch Dare this week! What an adorable card! Thanks for taking the challenge at Kaboodle Doodles! So pretty!! Great coloring and save by adding the charm. Your design is wonderful!